People only have a certain amount of energy, so the ways they use it are crucial. This is especially so when people are concerned about events that are happening in the world. People can then choose to do something worthwhile. 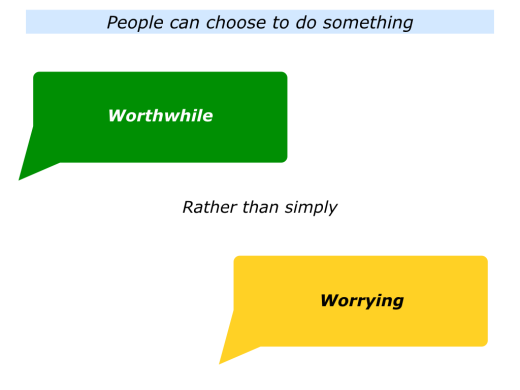 Alternatively, they can choose to simply descend into worrying. The choice they make has consequences for both themselves and other people. Today many people are choosing the first option. They are doing practical things that encourage both present and future generations. They are not falling for demagogues who spread fear or who promote themselves as the only ones who can save people from peril. Emotions are the material of life. A person may feel happy, sad, elated, disappointed, peaceful or angry. People can choose how they use these emotions. 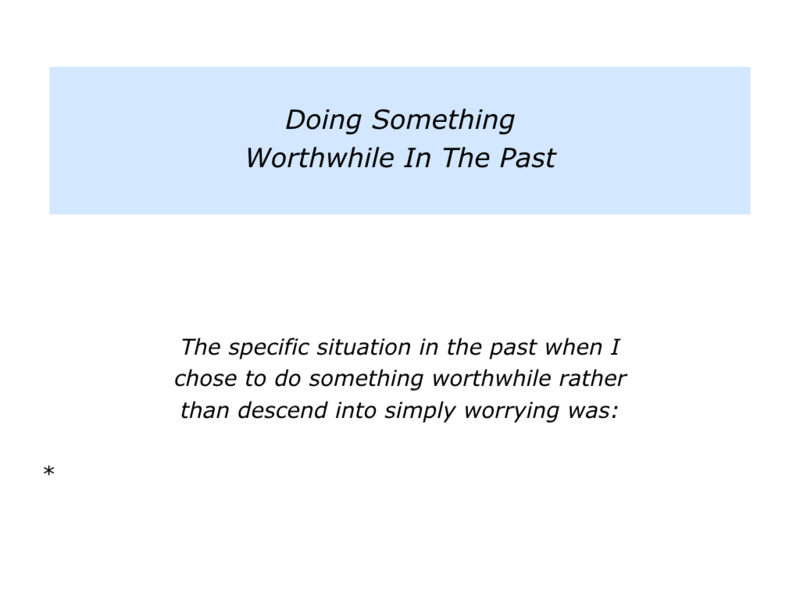 Looking back, can you recall a time when you chose to do something worthwhile rather than descend into worrying? You may have chosen to act kindly, encourage another person, care for your garden, pass on knowledge to people or whatever. 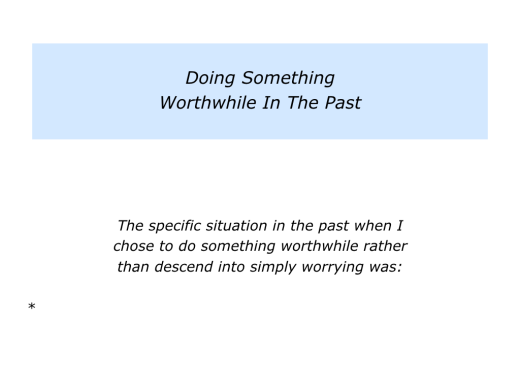 Describe a specific situation in the past when you chose to do something worthwhile rather than simply worry. 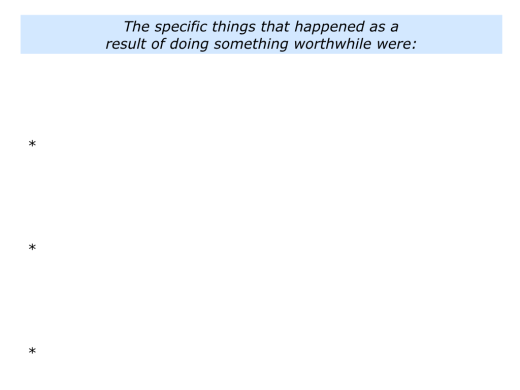 Describe the specific things you did then to do something worthwhile. People can choose to support the positive forces in life – both within themselves and within other people – or they can fall into paralysis. 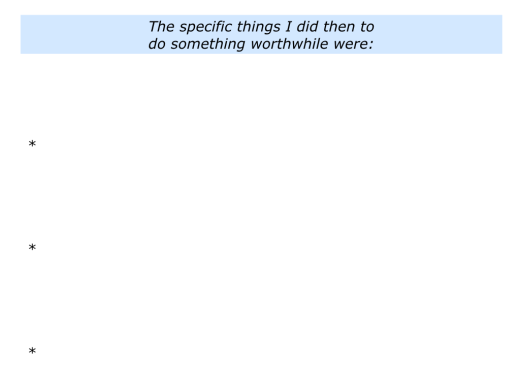 Sometimes the positive route simply starts by taking action and doing something worthwhile. Looking around the world you will find many people taking this route. They are raising money for charity, caring for others and planting seeds of hope. Certainly there are many darker forces. But it is important to take heart from the positive majority of people, however, rather than the psychopathic minority. 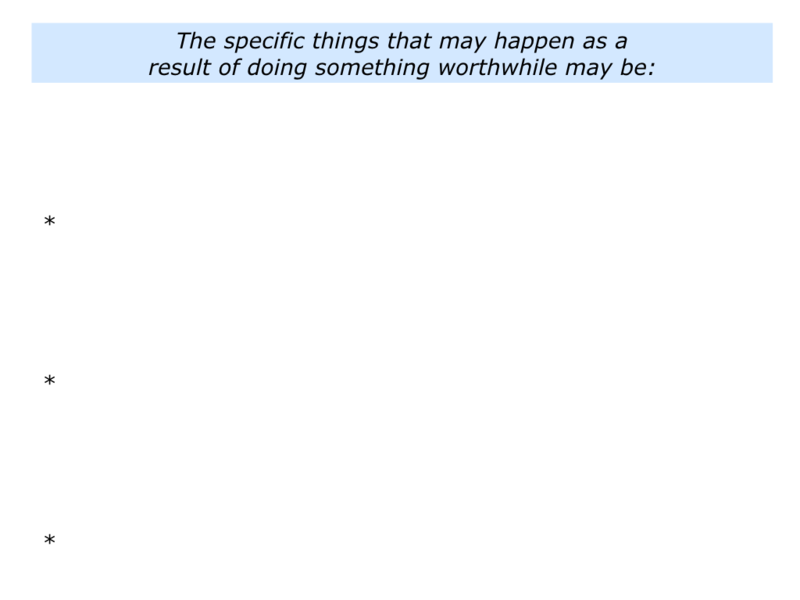 DoSomething.org, for example, is an organisation that channels the energy of young people under the age of 25. Anybody over that age is considered an old person. But, of course, older people have something to give in terms of mentorship and wisdom. The organisation is based in the USA, but it does have international arms. Here are excerpts from its website. 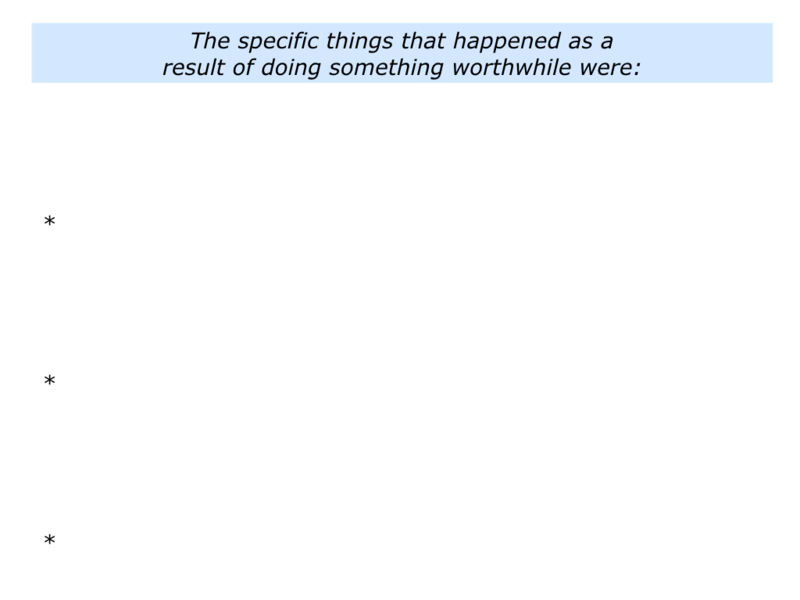 DoSomething.org is the place to come if you want to help make a difference in your community. We’re one of the largest global orgs for young people and social change. We have over 5.2 million members tackling social change campaigns that impact every cause, from poverty to violence to the environment. Basically any cause, anytime, anywhere. You can search our campaigns to look for something to do that matches your cause interests, how much time you have, and what kind of action you want to take (volunteer, make something, donate something, etc). If you need any help getting started or have any more questions, don’t hesitate to reach out to us! 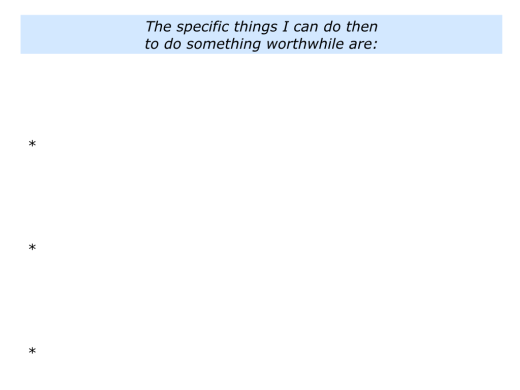 Let’s explore another approach to doing something worthwhile. Encore.org has the strapline second acts for the greater good. It enables people to use their skills to encourage both present and future generations. While many see our aging society as a problem, we view it as a solution. Those in and beyond midlife represent a powerful source of talent with the accumulated skills, experience and wisdom to tackle some of society’s most urgent challenges. By embracing this unique opportunity, we can transform a zero-sum prediction into a win-win strategy, creating a better future for generations to come. Neither young nor old, the vast population moving into midlife offers an extraordinary resource. Some are able to do so as unpaid volunteers or in roles in their communities or families. 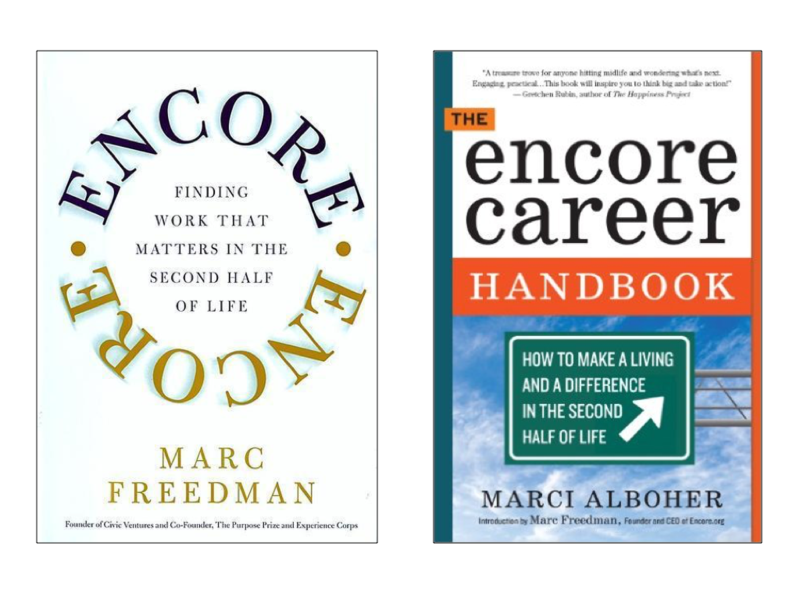 But for many, encore work can bring a new source of continued income. As one approaches later life, there is a natural urge to think about legacy – about how we will be remembered, how we can influence the lives of young people and how we can leave a mark. The encore vision is rooted in this concept of “generativity,” which is why our animating idea is about leveraging the experience of older adults to improve our world now and for future generations. At a time when there are so many critical problems in our education and health care systems, in our government, in our environment and on our streets, we can’t afford to let decades of experience go to waste. You can discover more in the following two books. 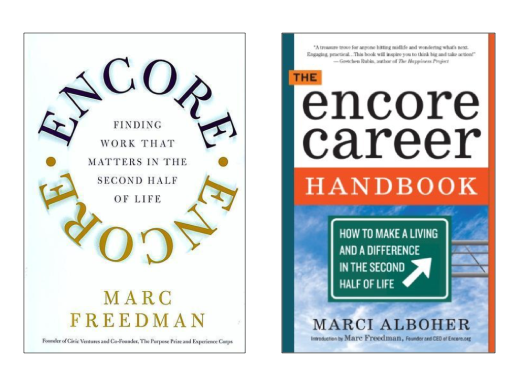 Marc Freedman Encore: Work that matters in the second half of life and Marci Alboher The Encore Career Handbook: How to make a living and a difference in the second half of life. Let’s return to your own life and work. 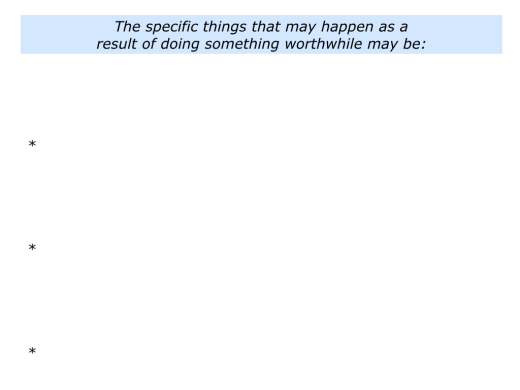 Looking ahead, can you think of a situation when you may want to do something worthwhile rather than succumb to worry? This could be in your personal or professional life. You may simply want to show kindness, encourage another person or create something beautiful. You may want to find solutions to a challenge, lead a pioneering project or find other ways to plant seeds of hope. How can you translate your feelings into action? When you do you begin? What may be the benefits – both for you and for other people? Describe a specific situation in the future when you may choose to do something worthwhile rather than simply worry. 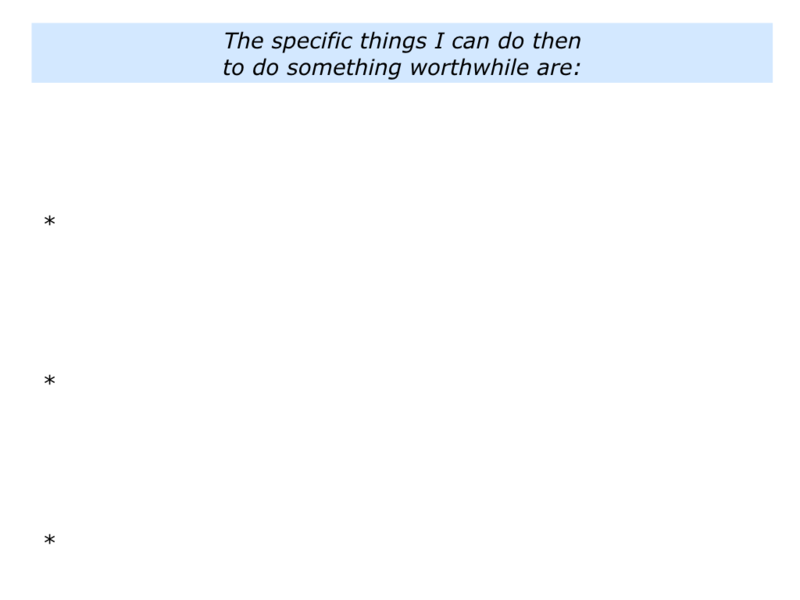 Describe the specific things you can do then to do something worthwhile.